This Pro-Flex 1-1/2" vacuum hose is as good as they get for carpet cleaning and other demanding, industrial uses. Strong, chemical & heat resistant yet light-weight & flexible! Don't learn the hard way... lesser vacuum hoses will kink, leak, tangle and degrade quickly in harsh environments. This is a super premium, high quality carpet cleaning vac hose. This 1-1/2" carpet cleaning vacuum hose is as preimium as they come. Built heavy duty, yet surprisingly light, for ease of use by the Professional Carpet Cleaner who wants nothing but the very best. This vac hose will not crush, kink or melt in all but the most harsh environments. Built to handle the high heat & chemicals associated with demanding, industrial applications. This premium Carpet Cleaning Hose will increase vacuum in carpet cleaning extraction machines due to it's smooth inner bore. 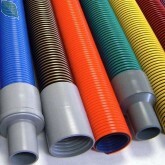 This 1-1/2 inch Vac Hose comes without hose cuffs. 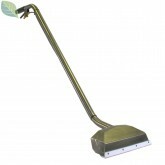 Is light weight and easy to handle. Flexible to comfortably coil into small diameter circles. Will Last for many,many Years! Non-marring, Very strong & PVC Free! 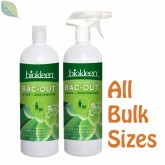 Product is built from Polyethylene, an extremely durable plastic. Use with any truck-mounted or high power portable steam extraction system for much greater durability, and to slightly increase cleaning efficiency, thus drying carpets faster and reducing energy usage. For use in many other industrial applications where the hightest quality, premium vacuum hose is required. Generic Hose Diagram (for all sizes): View PDF. If you are cleaning with a medium to high powered truck mount, we strongly recommend upgrading to 2.0 or even 2-1/2" vacuum hose. Scroll down page to view related products. Then click on 2.5" vaccum hose for details on how to connect to your machine. We have yet to find a hose of such quality with a more eco-friendly design. The manufacturer of this hose strives to manufacture premium quality equipment that reduces energy consumption through the virtue of its smooth inner bore and wider diameter which both help to reduce air flow restriction and cavitation. Product is shipped in a cardboard box, and the box as well as the hoses are recyclable at end of life (Contact Us for recycling info). U.S. Based Manufacturer meets U.S. emissions requirements. Product is built from Polyethylene which is much safer for the environment than PVC. Amflex produces products that improve equipment efficiency and decrease energy consumption. 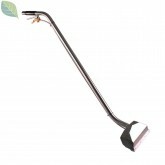 The company states that their manufacturing process is safe for the environment. Amflex manufactures very high quality hoses, extending product life, thereby reducing the amount of waste that ends up in landfill. The Company claims to recycle everything possible during the manufacturing process and will even provide credits for damaged hoses that are returned to their plant to be recycled. All of The Companies hoses are PVC free. We have been unable to ascertain an Industrial hose production company that is more sustainable than Amflex. Please respect the environment, and do not throw your "dead" hoses away. Recycle them. Please inquire with us about how to recycling your used hose at end of useful life. It can be shredded and shipped back to the manufacturer to be made into new products. If the hoses are not heavily contaminated, the manufacturer will often provide a monetary credit for the materials as well to help offset shipping costs associated with their return. Amflex Guarantees their Hoses from defects in Materials and Workmanship for 30 days from time of purchase. Normal wear & tear is not covered by their warranty. If, upon inspection, vacuum hose is found to be defective, Amflex will repair or replace hose at their discretion. Click View PDF to view a handsome list of chemicals and their compatibility with this hose. At Bulk Green Cleaners, we offer PVC plastic "thread on" Hose Cuffs & Connectors for this 2" (2.0") high quality, industrial use vacuum hose. Please select the options you need to connect your hoses, and keep in mind... whatever number you fill in in the "Qty" box to the left of the "Add to Cart" Button, will increase not only the number of Hoses you selected, but also the number of Cuffs selected in the drop-downs - by that amount. You can Click HERE to view images of the Cuffs and Connectors available for this 1-1/2 inch vacuum hose. Please Contact Us if you still need help selecting connectors.